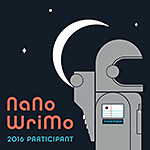 Long time readers of this blog know that I have participated in NaNoWriMo several times before. Now I'm about to participate again. NaNoWriMo is National Novel Writing Month, a challenge in which people write 50,000 words in the 30 days of November. Usually people write novels, or at least part of a novel. The challenge takes place all over the world, with people of all ages, languages, and levels of experience using the month of November to motivate themselves to write. This year I will be writing a non-fiction book instead of a novel. It's a book I have been thinking about and working on for about two years, but I found that I wasn't making progress, so I decided that NaNoWriMo would be a good opportunity to make the effort to write every day and get it finished. I will be starting from the beginning, not using what I have already written. The subject of my book is cats, and specifically how we can make ethical and responsible decisions in our relationship with cats. I will be presenting a way of thinking about the advantages and disadvantages of various decisions for us humans and for our cats. I intend to self-publish this book, and hope to interest the kitten cam viewer community in it, so they can help spread the word. If it sells well, I will be donating a share of my profits to the cat-related organizations I support. I find it very poignant that just recently the word "Nano" has come to mean something else to me, in addition to "NaNoWriMo". Nano is the name of a small kitten rescued by TinyKittens, whose short life inspired many to help cats in various ways. The recent Fixathon was named after Nano, and I have heard that many viewers have started, or continued, perhaps more intensively, to volunteer in shelters, to foster kittens in their homes, or to donate to organizations involved in saving cats. Everyone does what suits them best. I see one of my main roles in life as writing about things I care about and informing and educating my readers. This book, written during NaNoWriMo, will be my contribution to the #nanoeffect, as people are calling the influence of Nano's life story on those it touches. I hope that the book can have a ripple effect, spreading the cause of treating cats ethically and responsibly to many more people beyond the kitten cam community. So you are doing it again!Good luck! This month I am finishing a stitched calendar!AriadnefromGreece!